A few weeks ago I saw a tutorial in a project magazine for making your own raspberry vinegar. I thought it would make a perfect holiday gift that I could get started on early because it’s never too soon to begin preparing for the holidays. Unfortunately, I can’t credit the original magazine because I was hastily trying to take a mental snapshot of the tutorial while Matt was trying to hurry me along past the magazine rack. Sure, I could have purchased the magazine, but that takes all the fun out of it, right? Thankfully my memory came through on (most of) the details, and my homemade raspberry vinegar turned out beautifully. And thank goodness! I’ve had a lot of busted projects lately. But you can never succeed if you never try and risk failure. Am I right? This recipe is simple, requiring only two ingredients. 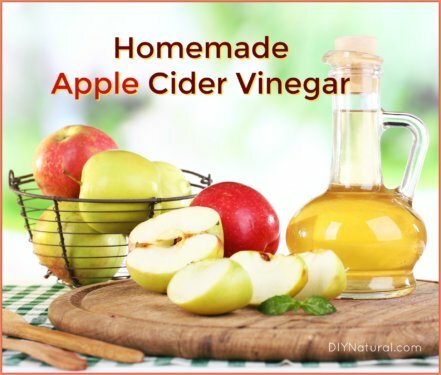 The resulting vinegar has a long shelf life, can be used as a tangy addition to recipes, and makes a unique gift. Moreover, you can get the antioxidant benefits of raspberries from this vinegar even when the fruit isn’t in season. In a small, non-reactive saucepan, combine vinegar and raspberries. Bring to a boil and reduce heat. Simmer, uncovered, for about 3 minutes. Transfer mixture into a clean quart jar. Cover the jar with a tightly-fitting plastic lid, or cover jar with plastic wrap first, then metal lid. Store jar in a cool, dark place for 2 weeks. Be sure to label your jar with a “ready” date. Line a colander or mesh strainer with a few layers of cheesecloth and place over a glass bowl. Strain vinegar through the cheesecloth, allowing it to drip into your bowl. (This process may be slow if berries clog the cheesecloth.) Do not smash berries to release vinegar or your raspberry vinegar will be cloudy. Compost or discard berries. 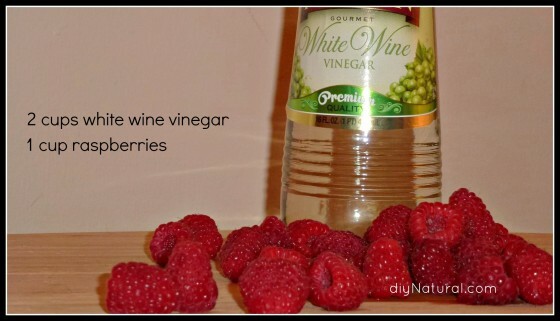 Transfer your raspberry vinegar to clean glass bottles with tight fitting lids. 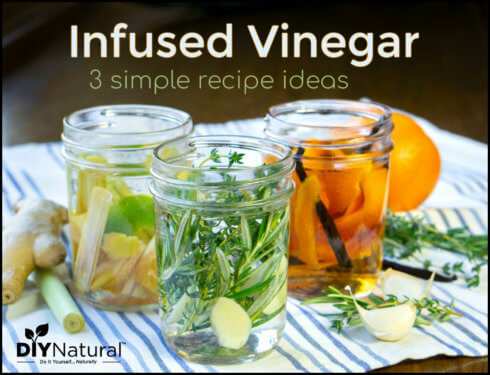 Before starting this project, make sure you purchase white wine vinegar with at least 5% acidity. This is important so the finished product will keep. Your raspberry vinegar should keep for up to a year. Store your new ruby red vinegar in a cool, dark cupboard or pantry alongside your other vinegars. We have been having fun with our raspberry vinegar by using it in unique and creative ways. We encourage you to try them too, along with any others you can think of. Salad Dressing: We’re starting to get more fall greens in our CSA, and I thought a tangy raspberry vinaigrette would be a nice change from our typical oil/vinegar dressings. 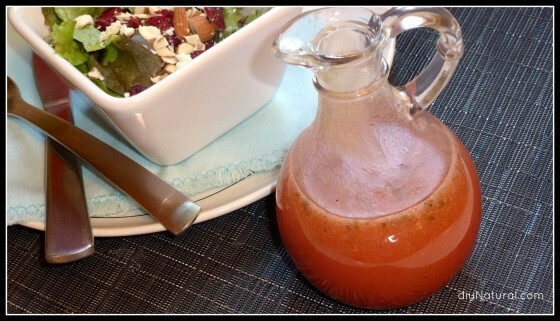 See the raspberry vinaigrette dressing recipe below! Flavoring meals: Add the vinegar to your meals as a marinade, reduction, or glaze. See these suggestions for using raspberry vinegar in side or main dishes. Dessert topping: Yes…vinegar on your dessert! If you like vinegar-y things, you must try this: splash a little of the raspberry vinegar over vanilla ice cream. I know it sounds strange, but it’s delightfully tangy and complimentary to the vanilla! Combine all ingredients in a glass bottle or jar with a tight fitting lid. Shake well to combine. Serve over mixed greens with berries, nuts, crumbled cheese, and homemade croutons. 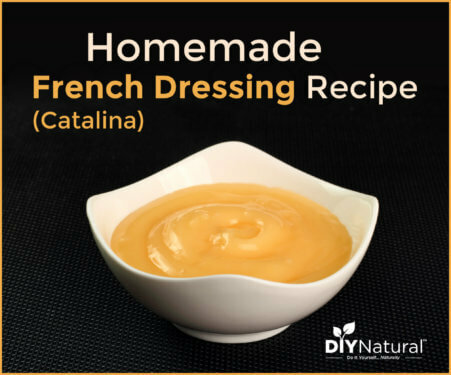 This dressing will keep in the refrigerator for several weeks. Enjoy your homemade raspberry vinegar in this vinaigrette dressing, along with any other creative uses you can think of. 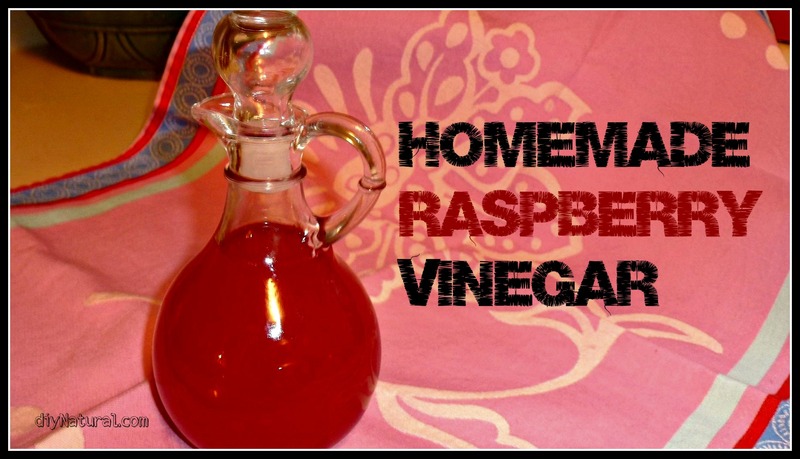 Comment below with other creative uses for this raspberry vinegar. Thank you for the flavored vinegar idea! I tried it and found that it was absolutely delicious. I made a dressing with it for a family party a couple of weeks ago, and it was definitely a crowd pleaser. I can’t wait to make more for the holidays. Yay! Thanks for returning and sharing your feedback Kayla! Oh thanks for this dressing recipe too. I used to make all kinds of flavored vinegars and love using them on all kinds of things. I figured I had to give readers at least one concrete recipe for using the vinegar. 🙂 I can’t wait to make more of these flavored vinegars!